Be the first to share your favorite memory, photo or story of Ricky. This memorial page is dedicated for family, friends and future generations to celebrate the life of their loved one. 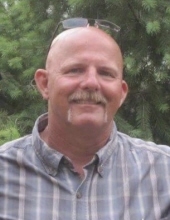 Ricky Lee Purvis, 59, passed away on Tuesday, April 02, 2019. A native of Frankfort, he was born on May 5, 1959 to the late James Harrison Purvis Sr. and Dorothy Jean Quire Purvis. He worked as a plumbing supervisor for Dynamax Corp and worked at Jim Beam Distillery prior to that. He is survived by his children, Jennifer Purvis (Joel Howard), Kelsey Purvis, Kaycee Purvis, Kadey Purvis, Ricky Lee Omer Purvis, Ryan Douglas Ennis Purvis, and (nephew) Brandon (Mary) Sandefur; his grandchildren, Tyler Purvis, Harper Howard, and Ramsey Howard; his brothers, Jessie (Sharon) Purvis, and Harold Purvis; his sisters, Beverly (Freddie) Hockensmith, Lisa Hockensmith, Barbara Crawley, Vicki Moran, and Mary Jo Earnhart; as well as several nieces and nephews. Ricky is preceded in death by his brother Jimmy Purvis and sisters Pam Hockensmith, Phyllis Lee, Elsie Smith, and Sandra Jennings. Ricky Lee loved to watch his boys wrestle and his girls play softball. He was a diehard Louisville Cardinals fan and loved to watch old westerns. Memorial service will be held at 7:00 p.m. on Friday, April 12, 2019 at North Frankfort Baptist Church located at 7945 Owenton Rd. In lieu of flowers, memorial contributions may be made to Hospice of the Bluegrass or the Defeat MSA at defeatmsa.org. To send flowers or a remembrance gift to the family of Ricky Lee Purvis, please visit our Tribute Store. "Email Address" would like to share the life celebration of Ricky Lee Purvis. Click on the "link" to go to share a favorite memory or leave a condolence message for the family.